Or Gallery is pleased to present Night Shift, a collaborative performance by Brady Cranfield and Jamie Hilder that explores the parallels between the speculative spaces of the gallery and the market. In response to the idea that titanium dioxide, the primary ingredient in white paint, is used as an indicator of economic recovery, the artists will paint the walls of the gallery white every night for the duration of the exhibition. 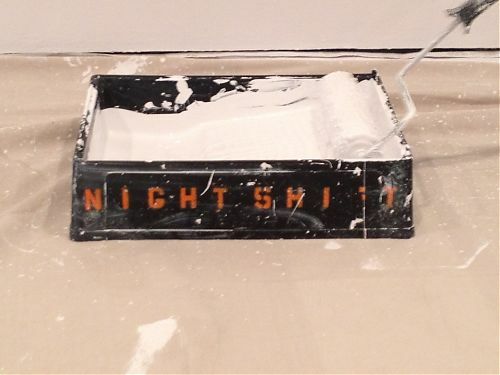 As the title implies, the artists’ labour will take place at night while the gallery is closed and will be performed for an amount of time equal to the gallery’s regular business hours. Several microphones will record the sounds of the painting and these sounds will be played back during the day while the gallery is open to the public. Over the course of the exhibition, as paint builds up on the wall, these sounds will also accrue after each night’s work, with each subsequent track layered on top of the previous night’s recordings. This exhibition is part of Cranfield and Hilder’s larger inquiry into the “Economist’s Aesthetic” – a term they use to describe the effects of the growing influence of the rhetoric of business upon global political discourse. The accumulation of paint and sound in Night Shift continues this investigation by considering how labour and value are quantified within contemporary economic and artistic discourse. Jamie Hilder is a Los Angeles and Vancouver-based artist and critic whose work engages performance and social critique. His work has appeared in solo exhibitions at Artspeak Gallery and Charles H. Scott Gallery. Hilder completed his doctoral dissertation on the International Concrete Poetry Movement at the University of British Columbia in 2010. He is currently a post-doctoral researcher in the Graduate School of Education and Information Sciences at UCLA. Brady Cranfield is a Vancouver-based sound and visual artist, musician and writer. He has a MA in Communications and a MFA from SFU. His work has been exhibited and performed across Canada.